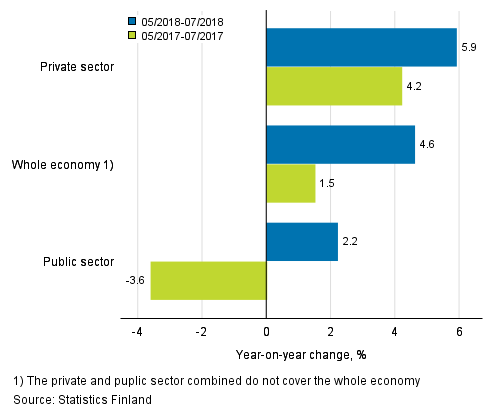 According to Statistics Finland’s data, the wages and salaries sum of the whole economy was 4.6 per cent greater in the May to July period than in the corresponding period twelve months earlier. In July, the wages and salaries sum of the whole economy grew by 4.4 per cent from the year before. One year previously in May to July, the wages and salaries sum of the whole economy increased by 1.5 per cent. The wages and salaries sum grew in all main industries in May to July. 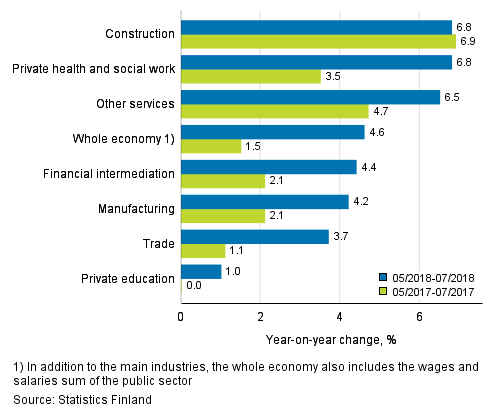 The growth in the wages and salaries sum was fastest in private health and social work (6.8%), construction (6.8%), other services (6.5%), financial intermediation (4.4%) and manufacturing (4.2%). The increase in the wages and salaries sum was most moderate in the industries of trade (3.7%) and private education (1.0%). The wages and salaries sum in the private sector was 5.9 per cent greater in May to July than twelve months earlier. The wages and salaries sum of the public sector was 2.2 per cent higher than in the corresponding period one year previously. In July, the wages and salaries sum in the private sector increased by 5.9 per cent and in the public sector by 1.6 per cent from one year earlier. In the May to July period one year ago, the wages and salaries sum grew by 4.2 per cent in the private sector, while in the public sector the wages and salaries sum decreased by 3.6 per cent year-on-year. The wages and salaries sum refers to the sum total of the gross wages and salaries paid to employees without incentive stock options. The wages and salaries sum is influenced by changes in employment and in the earnings level of wage and salary earners. ISSN=1798-6125. July 2018. Helsinki: Statistics Finland [referred: 22.4.2019].